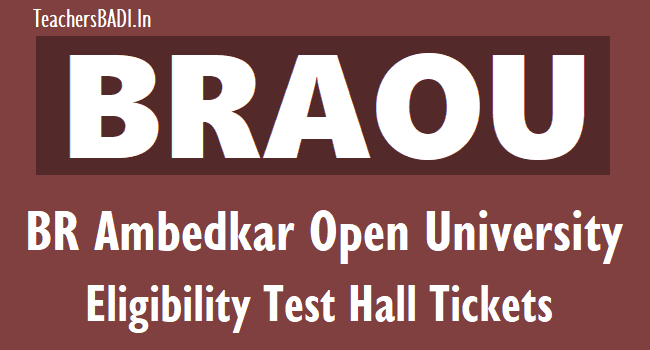 BRAOU BR Ambedkar Open University Eligibility Test Hall Tickets 2019, BRAOU Eligibility test Hall tickets 2019. Medium and Venue of Entrance test: This eligibility test will be conducted in Telugu, English and Urdu in all study centres of Telangana and A.P states. Test will be conducted in ENGLISH, TELUGU & URDU MEDIA at the Study Centres of Dr. B.R. Ambedkar Open University. How to get Hall Tickets? Step 2: Search for "Download Eligibility Test 2019 Halltickets" and click on it. Step 3: BRAOU Eligibility Test 2019 Hall tickets Download page will be opened. Note: Hall ticket for the candidate those who have registered and paid ET registration fee after 28-03-2019 will be available..